Getting started: This is a wonderful spring art project. I like to begin this project by reading to my students the Eric Carle's book: The Grouchy Ladybug. About this project: To familiarize the instructor with puppet making, you might want to look through the book Puppets and Masks by Nan Rump. 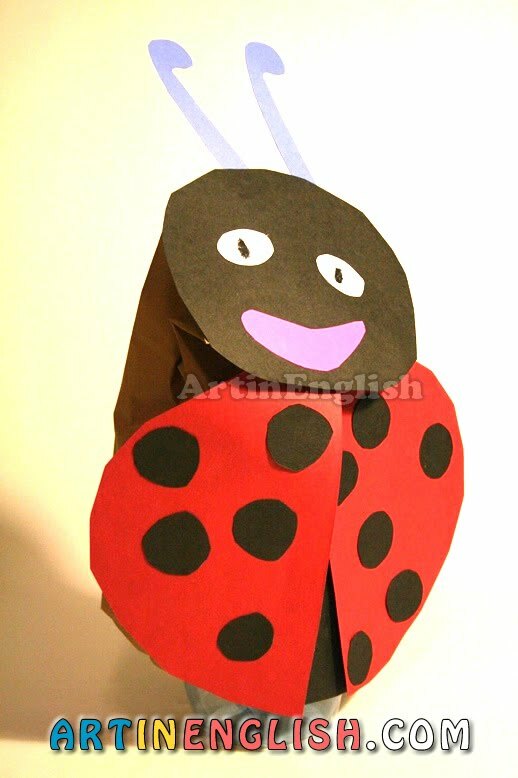 Students will be delighted with the results of these cute lady bug puppets. Have fun! Show how to draw the eyes, nose, ears, tummy and wings separately. Demonstrate blending oil pastels, and repeat colors throughout the composition. Demonstrate how to draw lady bug spots. Glue head on to the bottom of bag. Glue the tummy under the head. Add wings and other parts. With especially fast workers, I have them color in the back of the lady bug while other art students finish up. Save this in a notebook of kindergarten art lesson plans. Think back to the last time you saw a lady bug? Art & craft lessons are a good place to meet up with them again. Art Therapy Ideas: This lady bug art & craft project is a great way to stimulate a child's imagination. Ask where you would fly if you were a lady bug? Have your young client speak in first person, and be the lady bug. Who would they like to invite to fly with them? Help your young client plan an adventure. What would the lady bug like to say to other members in his/her lady bug family? It would be helpful if the therapist had another animal puppet and used it while creating a dialogue. Remember, when you have the art piece speak, it's a gestalt art experience. To get more information on this topic, you might like to refer to the book by JanieRhyne called The Gestalt Art Experience: Patterns That Connect.